Candace Parker is an American professional basketball player for the Los Angeles Sparks of the Women’s National Basketball Association (WNBA). She was the first overall pick in the 2008 WNBA Draft. Among her awards, she has won a WNBA championship (2016), two WNBA Most Valuable Player Awards (2008, 2013), WNBA Finals MVP Award (2016), WNBA All-Star Game MVP (2013), two Olympic gold medals (2008, 2012), and the WNBA Rookie of the Year Award (2008). 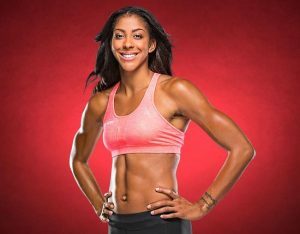 Born Candace Nicole Parker on April 19, 1986 in St. Louis, Missouri, to Sara and Larry Parker, her family moved to Naperville, Illinois when she was just two years old. The youngest of three children, Candace has two older brothers: Anthony Parker, who is a former NBA basketball player, and Marcus Parker, who is a doctor. Candace’s whole family loved basketball, and she started playing at an early age. Her father, Larry, played basketball at the University of Iowa in the 1970s. She attended Naperville Central High School in Naperville, Illinois in 2004, where she won the 2003 and 2004 Gatorade National Girls Basketball Player of the Year awards. She married NBA center Shelden Williams in 2008, and the couple had a daughter named Lailaa in 2009. They separated in 2016. *She was born in St. Louis, Missouri on April 19, 1986. *She is the younger sister of former NBA player Anthony Parker. *She won both the WNBA Rookie of the Year and MVP awards in 2008. *People named her one of the top 100 Most Beautiful People in the World in 2007.